I’m Wei Wen (温伟), a Ph.D. candidate in Duke University, supervised by Dr. Hai (Helen) Li and Dr. Yiran Chen. My research is Deep Learning and its applications in Computer Vision and Natural Language Processing. Recently, I focused on understanding learning algorithms, structural learning for accurate and efficient deep neural networks, and optimization algorithms for distributed deep learning. I am on the job market in 2019. I will intern at Google Brain in this summer. I enjoyed research internships in Facebook Research, Microsoft Research Redmond & Asia, and HP Labs, where I incorporated my research into industrial AI productions. My Ph.D. thesis is “Efficient and Scalable Deep Learning“. Committee: Hai (Helen) Li, Yiran Chen, Robert Calderbank, Yangqing Jia and Guillermo Sapiro. My research topics were SmoothOut algorithm to escape sharp minima in deep neural networks to understand generalization, TernGrad SGD to overcome the communication bottleneck in distributed deep learning, and structural learning algorithms to learn sparse and low-rank structures in deep neural networks for faster inference. Worked on distributed deep learning. Nathan Inkawhich, Wei Wen, Yiran Chen, Hai Li. 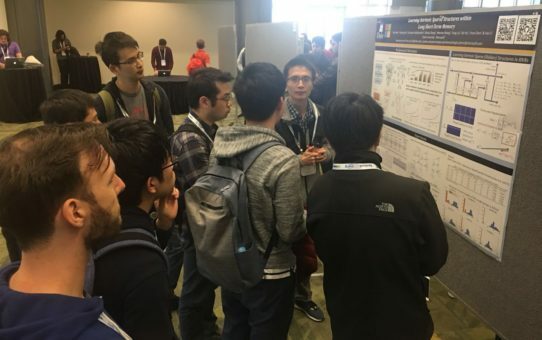 “Feature Space Perturbations Yield More Transferable Adversarial Examples.” The Conference on Computer Vision and Pattern Recognition (CVPR) 2019. First 3 years in University of Pittsburgh, then moved to Duke with my advisors.